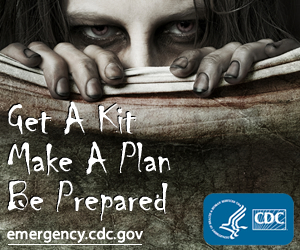 In an effort to make preparedness more fun, the Centers for Disease Control has released an article on how to prepare for a Zombie Apocalypse. I like that they are helping make preparedness fun. Hopefully people will become better prepared as a result. Thanks to KSL.com for alerting me to this threat. One disadvantage of Mylar pouches is what to do with the product after you’ve opened the pouch. I’ve found it difficult to store an open Mylar bag of dry milk in my cupboard without dry milk ending up everywhere. I’m currently rotating out some dry milk I canned a couple years ago and my solution has been to pour the dry milk into a large plastic bin with a lid. However it seems the quantity of milk in the pouch is always a little more than the size of the bin and pouring the milk into the bin often results in a light dusting of sticky dry milk on the counter. My new solution is to can all of my products in #10 cans. The product doesn’t need to be transferred to a new container and when your done you might even be able to repurpose the can. Now what to do with all my pouches of dry milk. When I started yearsofplenty.com a couple years ago, my intent was to provide both a resource for people who wanted to prepare themselves but also a place for a web application to help people to rotate their supplies. If you search the Internet for "food storage rotation" specifically, one finds many ideas for rotating food. One resource I found last night is http://www.pep-c.org/storageandrotationtips/. Reading through the list I think two of the major reasons that I wanted to write this software was to account for making sure that rotation happened when necessary and as a side effect of having good data, I would also be able to solve things like estimating a rate of consumption and other data points that might be interesting to my family. I have yet to write the software but now with the primary goals written down maybe I can start getting something off the ground. Drop me a note if you have thoughts or suggestions that might be helpful on managing inventory in a cost-effective and simple way.